The uninterruptible power supply (UPS) DPA 250 S4, with its market-leading module efficiency of 97.6 percent, offers more than 30 percent lower power losses, top reliability, zero downtime and low cost of ownership. The DPA 250 S4 features ABB’s decentralized parallel architecture (DPA™), covers the power range 50 to 1,500 kW and is specially designed for critical, high-density computing environments such as small- to medium-sized data centers, commercial buildings, healthcare facilities, railway signaling applications and airports. One DPA 250 S4 250 kW cabinet can host up to six 50 kW modules for 250 kW N+1 redundant power. Up to six 250 kW frames and up to 30 modules can be paralleled for 1,500 kW of uninterrupted, clean power. Secure ring-bus communication ensures there is no single point of failure in the system. As well as providing a fully scalable and easily maintained UPS, with unparalleled uptime and energy efficiency, the DPA 250 S4’s dual conversion mode ensures power going to the critical load is cleansed of any grid noise or fluctuations. Its transformer-free IGBT (Insulated Gate Bipolare Transistor) converters, which feature three-level topology with interleaving controls, mean that the device is lighter and more energy efficient, with reduced cooling requirements. The DPA 250 S4 delivers a market-leading module efficiency of 97.6 percent and a system efficiency of 97.4 percent, setting the standard for the future of UPS evolution. Power losses are more than 30 percent below those of similar products on the market, which has a direct impact on the total cost of ownership. A traditional UPS is very inefficient when the load is low. Under such conditions, ABB’s Xtra VFI mode switches the UPS to ‘lean-power’ operation by optimizing the number of modules used to feed the load. In case of a load step, more modules are instantly switched to online mode. Xtra VFI mode also cycles the active modules to levelize aging. 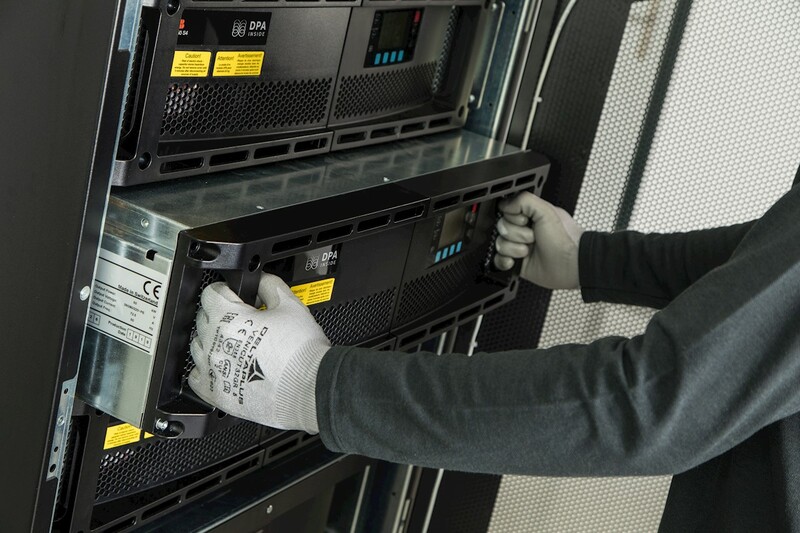 Featuring smart and secure power connectors, the DPA 250 S4 modules can be online-swapped, while other UPS modules in the system support the load, which both speeds and simplifies maintenance. Every DPA 250 S4 UPS module has all the essential functional units needed for independent operation. A primary benefit of the DPA is that it increases system reliability and availability compared to other modular UPS solutions as there is inherent redundancy between the UPS modules on all functional levels. DPA is ideal for organizations seeking zero downtime and low cost of ownership. Because DPA allows modules to be added as power needs grow, there is no need to oversize the original configuration, which reduces initial capital outlay. The front-facing and top or bottom cable entry allow different installation schemes. Backup power options are flexible and lithium-ion batteries can be accommodated. ABB has led the way in modular UPS technology and the launch of the DPA 250 S4 sets new standards in reliability and energy efficiency.